Just in case you’re visiting from Mars, Thursday is UK General Election Day. Whoopee! Especially whoopee if you’re a newspaper; circulations generally go up during election campaigns. It will be fascinating to see, once the dust has settled how circulations of physical newspapers did this time when set against the same newspapers’ online performances. What’s also fascinating is how newspapers genuinely think they can influence the electorate. It seems to be generally accepted that in the past the Murdoch titles, and in particular ‘The Sun’ has had an impact, albeit at a lower level than perhaps News UK journalists believe. 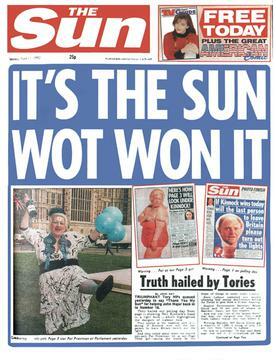 Certainly ‘The Sun’s’ famous 1992 headline ‘It’s The Sun Wot Won It’ was an over-claim. Indeed when he gave evidence to the Leveson Enquiry, Rupert Murdoch himself described the headline as “tasteless and wrong”, although if you happened to find yourself up in front of an enquiry examining press power and influence you might have been forgiven for saying something similar. People read newspapers that reflect their own prejudices, and so a newspaper telling you to do something you’re likely to have done anyway can hardly have been said to have had a dramatic effect on anything much. The question in 2015 is what role will social media play in the result? A far greater one than ever before is the general view. And what role will newspapers play? It’s worth considering that whereas the UK press is largely right-leaning, and that those right-leaning titles have been conducting a particular vicious personal campaign against (Labour leader) Ed Miliband, Miliband’s personal ratings keep growing, and as I write the two main parties remain neck and neck. Those on social media channels have called out the newspapers. ‘Facts’ have been checked, and found to be untrue; ‘letters of support’ from small businesses have been exposed as containing many names from organisations hardly qualifying as small businesses; one self-confessed fan of Ed Miliband has been targeted, exposed and bullied by a newspaper group worried sick that it might be losing its influence. Here’s a brilliant summary from Peter Jukes of how the large majority of our newspapers have been behaving as they start to realise that the electorate is not quite as malleable as perhaps it once was. How come our papers are so largely united in their adoration of the Conservatives? First, Miliband has shown a healthy disregard for the old and far-too-close relationship between our political parties (of all shades) and newspaper proprietors. He has talked of placing an upper limit on media channel ownership, a move that would likely force Murdoch to sell a newspaper and which allegedly led Murdoch himself to visit News UK to berate his journalists for not doing enough to stop the possibility of a Labour win. Miliband has also said he’ll implement the recommendations of the Leveson enquiry, a scenario one Editor described as ‘a disaster’, although many of the rest of us, the great unwashed think it’s rather a good idea. Then there’s Labour’s campaign against our non-domiciled business leaders and their tax affairs (step forward several newspaper proprietors). Finally, Miliband hasn’t played the game; he hasn’t danced attendance on the newspaper proprietors. As David Yelland, ex-Editor of ‘The Sun’ put it: “If (Miliband) is elected he will be the first PM for generations…to get into Downing Street knowing he owes no debts to any editor, any proprietor or any newspaper”. Furthermore they know it too. But whilst around 75% of newspaper circulations lean right, Miliband’s ratings keep rising, and no party is clearly ahead. When the analysts look back over the 2015 campaigns, special attention should be paid to the interview Miliband gave to the comedian, actor and activist Russell Brand that appeared on Brand’s YouTube channel. The fact that Miliband met with Brand in the first place was predictably monstered by the right-wing press, but my suspicion is that this was a particularly shrewd move. After all, Brand is in effect a channel; his YouTube posts reach an audience of over a million (particularly) young people, many of whom feel disenfranchised from the entire political system, and who spurn traditional media forms. But of course by giving him an interview, Miliband was tacitly accepting that he needed to step outside the magic circle of traditional newspapers to get his message across to one sector of the voting population; a move hardly likely to be applauded by those same traditional newspapers. Brand duly told his followers to vote Labour. All Miliband was doing was using the right channel to reach the right people. 1. Ed Miliband will form the next UK Government, with help from other parties. 2. Many of our newspapers will perform a remarkable about-face as the truth dawns on them that the guy their constituents have just elected Prime Minister has promised to reduce the power and influence of those proprietors attempting to use their positions to unfairly influence the political process. 3. The rest of us will realise that the days when newspaper proprietors controlled politicians via their apparent impact on voting patterns are past.